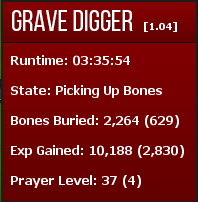 This script picks up and buries bones [multiple types supported] in areas where there are a lot of bones lying around just waiting to be buried. The script has a feature that runs back to the area where the script was started, in case the player ends up too far away from the area with all the bones. This script has been tested in the Lumbridge cow pens. 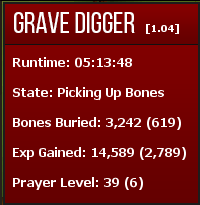 The amount of bones buried, and the experience gained is subject to the amount of other players looting bones. This bot does a fairly good job of beating other players to the bones. I DO NOT recommend botting for this long. Feel free to post any progress reports, suggestions, issues or bugs you may have encountered while running the script. i think the mouse is moving too mechanic, it does not flow, it just "teleports" directly to the position of the bones.. would you implement a some more antiban features? Otherwise a super nice script! Thanks! Got to 44 on 2 different F2P pures (lumbridge cow pens), so far so good! Bot will walk back to start from Lumby cow pen (behind Mage tower) at values below 35. Will test with higher number and update if this changes.